Dogs' lives are too short. Their only fault, really." Angela Hagen, Dianne Bowen, and Starline. 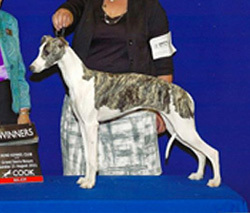 "Harper" finished in grand style with 4 majors, including BOW at the AZ Whippet Specialty under breeder/judge Mr. Charles Roberts in March, 2012. Less than a month after completing her championship, she made her debut as a special and captured Specialty Best In Show under breeder/judge Mr. Red Tatro at the Southern CA Whippet Association Specialty! We are very excited about this young girls future, and Starline is proud to be a part of it. Congrats to Angela Worden and Dianne Bowen. Starline is proud to co-own Harper and her lovely sister, "Hartley", Ch. 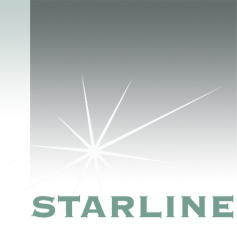 Starline's Oxford Victim Of Love. New Champion Oxford Princeton's Center of The Universe, "Harper", winning her 2nd 4 point major during the big Scottsdale hound weekend under Mr. David Peat. She was also BOW at the Arizona Whippet Specialty under breeder judge, Mr. Charles Roberts. Harper finished just a couple of weeks later on her very next outing with her 4th major!!!! Congrats to Angela Worden and Dianne Bowen.